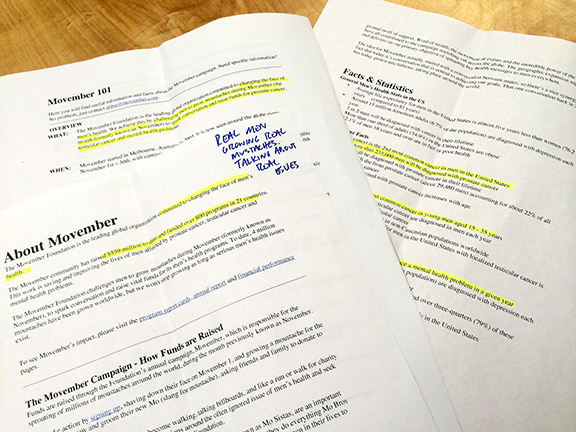 When I was handed the reigns to a Movember team last year, I set goals of making it bigger and raising more money than we did in 2013. But never in my wildest dreams did I think that what happened today would have been possible. Today I went on the Fox 13 Good Morning Memphis show to talk about Movember in hopes of drumming up MovemberMania team members and donations, but that’s not what even has me so excited. I’ll get to that in a minute. Sunday morning Tammy and I went down to Tupelo to pick up some mustache cookies that my Mom and sister made at Sweet Treats Bakery for my appearance. Because I didn’t want to sound like a total buffoon, I spent the majority of Sunday night locked up in the Man Cave going over Movember stats and making note cards to help me remember everything. These are just some of my Movmeber notes. I went from walking around talking to myself to sitting on the couch talking to myself, as I rehearsed what I wanted to say, how to say it, as I tried to not talk too much with my hands. I followed the same “normal” morning routine when I got up, with the only difference being that I kept reviewing my note cards instead of relaxing a little as I watched Joey, Ernie and Valerie on Good Morning Memphis. I loaded up all of my “goodies” – mustache coffee mugs, mustache cookies and Joey’s mustache bow ties – and got to the studio at 8:48 a.m. for my 9:20 segment. Turns out my segment wasn’t until 9:45, which meant I had almost an hour to sit and make myself nervous. 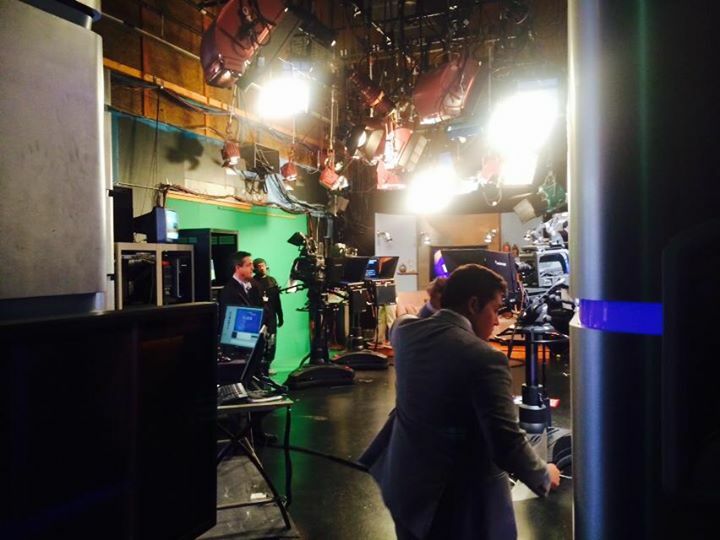 I was called back to the studio around 9:35 and that’s when reality started to hit me. The first thing I saw was Valerie and Ernie sitting at the desk. Then I saw Joey while Trey Paul photobombed me. Joey said my name then Valerie recognized me from “the tweeter” and things started to pick up the pace. Then the producer asked me a question that snapped my back to reality. 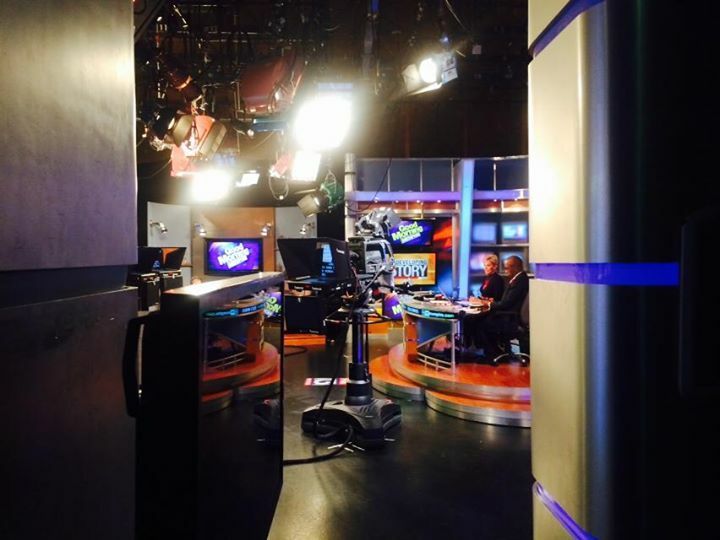 A before we were live shot from Valerie at the news desk. 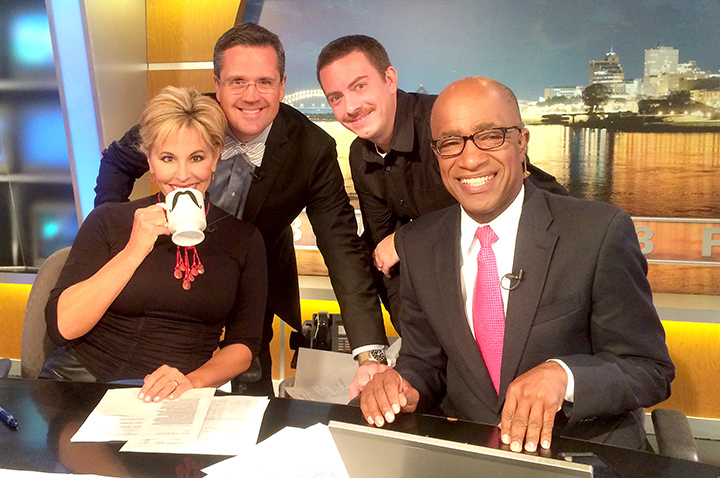 Producer: Do you want to show all of this (mugs, cookies, bow ties) on air? Me: Uhhhh… No, it’s fine. We don’t have to. Producer: Oh, we love props (starts rolling cart out in studio). My mind started freaking out. Mind: We didn’t practice for props!! We were sposed to be sitting on the couch for this. The producer put the cookies on a plate and made everything presentable while Joey talked to me about what he was going to say. Joey: How long do we have? Me: What? (eyes and mouth wide open) Fifteen minutes? I’m not prepared for fifteen minutes. They both laughed and said that’s about how long there was until the end of the show. Joey told me not to worry about anything because it will go by so fast and if I paused for anything he’d jump right in. Then he decided to give Valerie and Ernie their mugs so they could have them at the desk with them after our segment. Valerie loved hers, but Ernie didn’t want to open his because he thought they were all the same. But even after he opened it I couldn’t tell if he liked it or not — that’s just how Ernie is. Joey and I talked for a few more minutes off set and the next thing I knew it was almost time for us to go on. I could hear Wendy Nations doing the weather, but I couldn’t see her, and then she threw it to Joey. Turns out Joey knew what he was talking about because the segment flew by. I didn’t realize until I recorded it bootlegger-style with my camera that the segment had actually been over three minutes. After it was over, I thanked everyone for their kindness and their ability to make me feel more comfortable than I thought I would. I was actually more nervous watching the segment at home — and sweated more — than I was during the live shot. I was very happy with how it turned out and was glad that Joey said he was going to join the MovemberMania team (click to join or donate to the team). My phone was blowing up on the way back to work and I had tears in my eyes after reading all of the nice things people were saying about how it went. But what happened later that afternoon had me so happy that it took everything I had to not let tears of joy fall from my eyes. 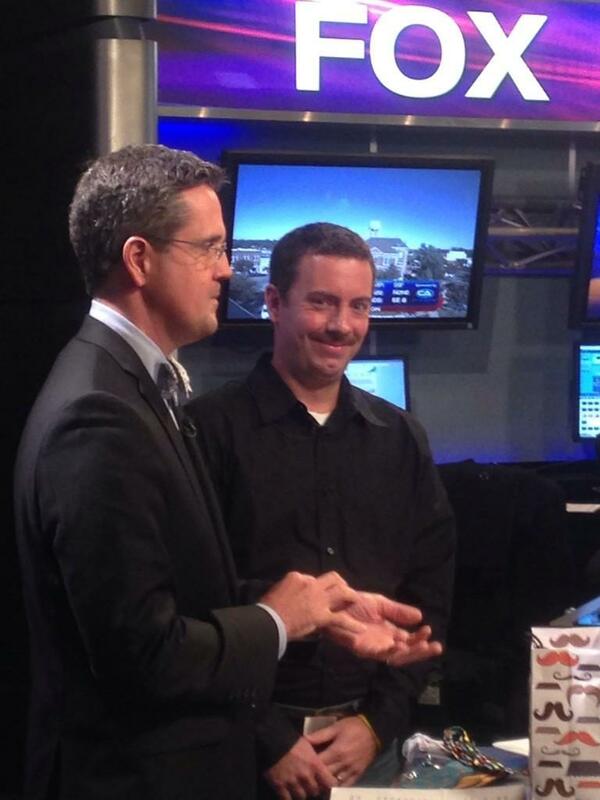 Fox 13’s Sports Director Matt Stark, is also part of MovemberMania. When I said I wanted to make this year’s efforts bigger than 2013, I NEVER imagined anything like this happening. 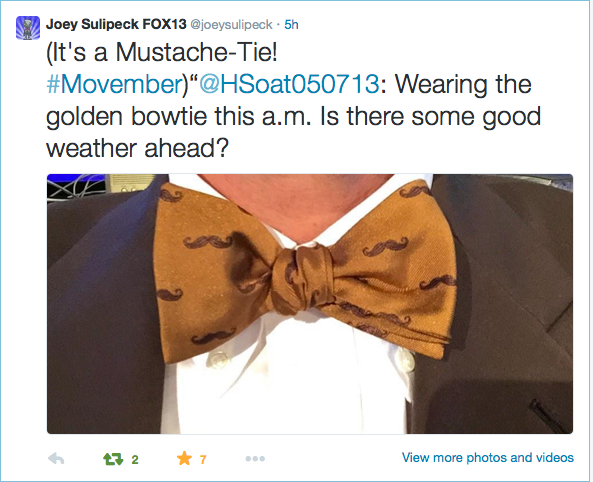 Initially I figured I’d just get Joey some mustache bow ties to wear on air and have him retweet my donations requests. 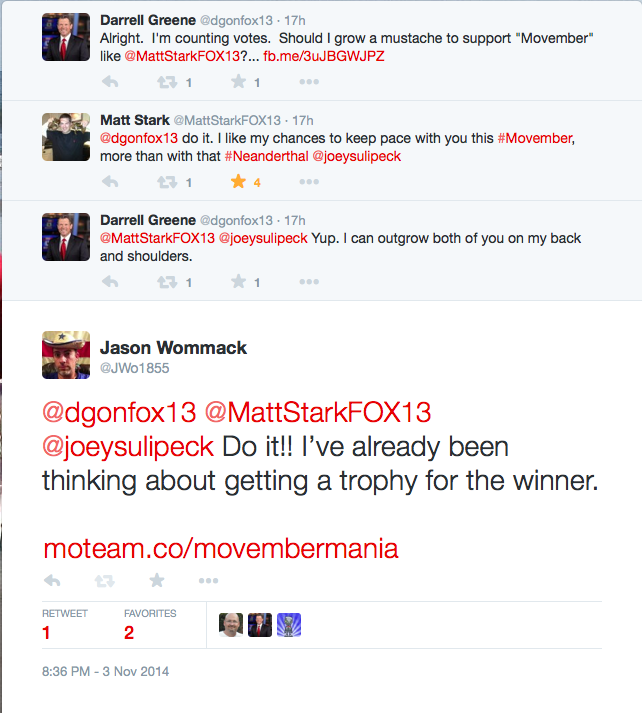 I’d have been happy if that’s how the 2014 MovemberMania campaign ended. So when he said he would join the team to help raise funds, I was ecstatic. Having the Fox 13 Sports Director, Matt Stark, join the team AND make it a competition with Joey is something I wouldn’t have thought was possible. …and now I’m thinking about getting a trophy made for the winner. 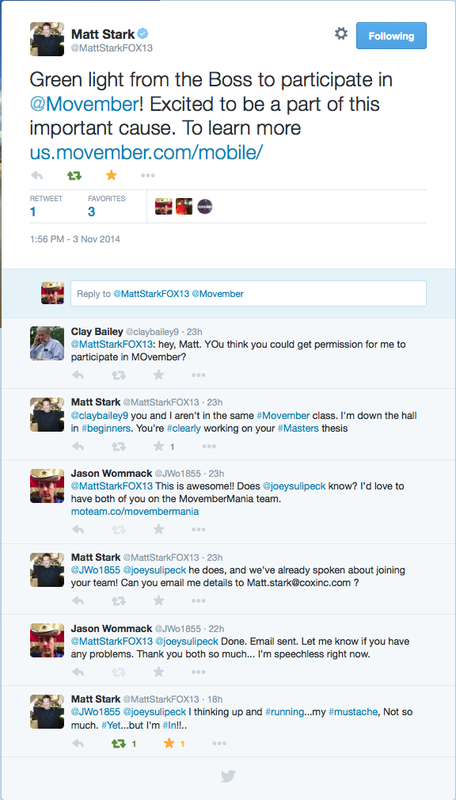 MovemberMania has gotten off to a great start, we just have to keep the MOmentum going. Gallery | This entry was posted in 2014, Daily Life, Movember and tagged daily life, entertainment, health, humor, life, Movember, MovemberMania, Peope, television, TV. Bookmark the permalink.